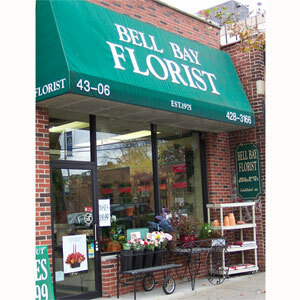 Bell Bay Florist is a family owned and operated business that has been serving Bayside for over 35 years. For three generations, we've been committed to providing our customers with the finest quality flowers and personalized service and attention they deserve. We are located on Bell Blvd in Bayside NY, the neighborhood we have lived in for over a half century. We proudly serve Bayside and the surrounding areas with daily deliveries of beautiful fresh flowers and plants. Thank you for visiting our website, we hope you find it helpful in choosing the perfect flowers for your occasion. Thank you for choosing flowers, thank you for choosing Bell Bay Florist. *To help assure on-time delivery during the busy holiday season, place your order at least 2 days prior to the following major holidays: Thanksgiving Day, Christmas Day, New Year's Day, Valentine's Day, Easter, Administrative Professionals Week, Mother's Day, Memorial Day, Father's Day, Independence Day and Labor Day. Our shop will always be closed on the following holidays: Christmas Day, New Year's Day, Memorial Day , Independence Day and Labor Day. We are open on Thanksgiving Day but do not provide delivery service. Our shop serves the following areas in New York: Bayside, Douglaston, Flushing, Whitestone, Little Neck, Floral Park, New Hyde Park, Great Neck, Fresh Meadows,Manhasset, Lake Success, College Point, Oakland Gardens, Bellerose, Malba and Roslyn. We can also send flowers anywhere nationally through our network of neighborhood florists via Teleflora and FTD, the two largest and most reputable companies in the industry. If you have any questions or need more information, please call us directly at (800)862-4257. We're always here to serve you and make your flower-sending experience a pleasure.